Nokia X2-01 is the cheapest QWERTY phone launched in India, its price is Rs 4459. The dimensions of the phone are 119.4 * 59.8 * 14.3 mm with TFT screen, 256,000 colors, 2.4 inches in size and weighs 107.5 g. It has 55 MB of memory 64 MB RAM, 128 MB ROM and microSD card for memory extension upto 8 GB. 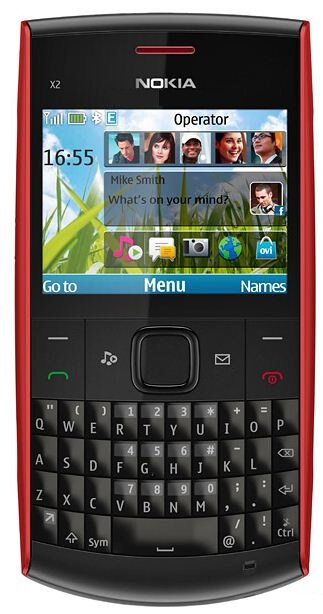 The other features of the phone are GPRS, EDGE, Bluetooth v2.1 with A2DP, VGA camera with a resolution of 640 * 480 pixels and video camera with resolution of 15 frames per second, it has speakers with 3.5 mm audio jack, MP3 and MP4 player, Stereo FM Radio, Games, Flash Lite v3.0, Messaging through SMS, MMS and Email. The battery is of 1020 mAh Li-Ion battery with standby power of 480 hours and talk time power of 5 hours. The phone comes in five colors like Azure, Silver, Red, Lilac, and DeepGrey. I am using an x2 01 myself but d shorthcut symbols are all wrong…what should i do?? Remove the shortcut …. If you are paying less price then you will get less options. And Nokia never compramise on Quality. Always provide good quality and good service. So its really good. remove the all shortcut options and use it friendly with lowest price. I using Nokia X2-01 handset, I was used Nokia higer end models as N73, N other series models. But as compaire to Price this is very good handset with good output, Sound clarity is good. Everything other options also good. Simply as per price of Nokia its really good model to user.